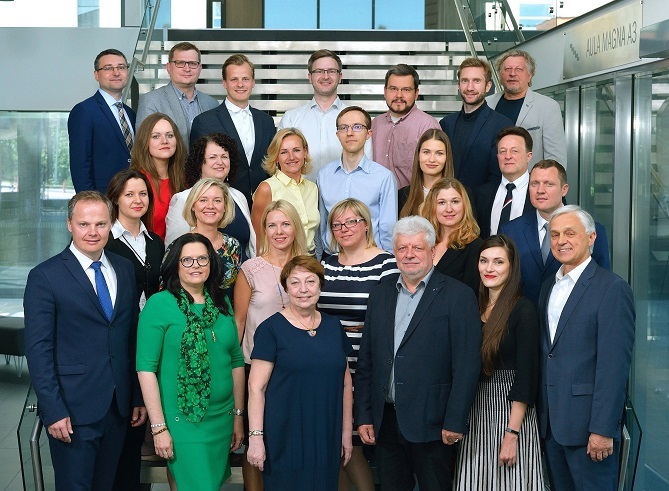 In the first row from the right to the left: prof. dr. Audrius Vaitkus; prof. dr. Daiva Žilionienė; prof. dr. Marija Burinskienė; prof. dr. Alfredas Laurinavičius, dr. Rita Kleizienė, head of department assoc. prof. Virgaudas Puodžiukas. In the second row: assoc. prof. Laura Žalimienė; assoc. prof. Kornelija Ratkevičiūtė; assoc. prof. Lina Juknevičiūtė-Žilinskienė; dr. Edita Šarkienė; dr. Aušrinė Griškevičiūtė-Gečienė; dr. Tomas Ratkevičius. In the third row: department administrator Guoda Varžgalytė; assoc. prof. Rasa Ušpalytė-Vitkūnienė; lecturer Jūratė Ryliškė; PhD. student Andrius Barauskas; PhD student Simona Zapolskytė; prof. dr. Donatas Čygas. In the fourth row: assoc. prof. Vytautas Palevičius; PhD student Andrius Baltrušaitis; PhD student Jonas Damidavičius; assoc. prof. Viktoras Vorobjovas; assoc. prof. Vytautas Grigonis; PhD student Vytautas Dumbliauskas, lecturer Algirdas Motiejūnas. In 2012, the Department of Roads of Vilnius Gediminas Technical University, which prepares high qualified road engineering students and has withstood the test of time, commemorates the eighth decade of its existence. After the First World War, there was a lack of specialists in all technical spheres in Lithuania. Acknowledging this, Lithuanian engineers, who had spread around the world as a consequence of war and revolution, returned to Lithuania just after the independence was restored. On their initiative, in 1920, High Courses, which also included technical subdivisions, were established. In 1922, the High Courses were developed into Lithuanian University. When Lithuanian University in Kaunas was being founded in 1922 March 22, the Department of Roads was established as one of the departments of the Faculty of Technics. The Statute of the established University was confirmed by Lithuanian Parliament in 1922 April 12. From the very first days, the Department of Roads started its active educational as well as scientific activity. In total, from 1949 to 2011, there have been 1592 engineers prepared, 1519 of which are road engineers, and 73 - railway engineers. Since 1994, after a new study system was introduced, 848 Bachelor and 505 Master students were prepared. In Lithuania, there are 21,3 thousand km roads of national importance: 14,6 thousand km of regional roads, 4,95 thousand km of national roads, and 1,75 thousand km of highways. Lithuania takes pride in its roads, and particularly, in its main artery - Vilnius-Kaunas-Klaipėda. There is a significant contribution of many graduates of the Department of Roads to this highway and many others. "Most of our students are motivated and knowing what kind of work they want to do after graduation. We cannot say that we offer easy studies or that the speciality of a roadman is effortless. The truth is that the study process is demanding, students have to cover many technical and difficult disciplines, fulfill many tasks and overcome many barriers. However, by asking students to meet high standards of the University, we ensure the quality of the studies which, in turn, attracts young people. Road Engineering is an area of engineering which is and will definitely be significant at all times. In 1995, Lithuanian economy recovered and, as a result of collaboration with business sector, we managed to raise a generation of new specialists. There were times when there was a lack of Road Engineering students and we had only 8 second-degree students. Later on, the need for roadmen has been increasing gradually and now every year there are about 1 hundred graduates of Bachelor studies. Essentially, we provide Lithuanian market with specialists. We are pleased that the education of first-degree Road Engineering students is fairly fundamental and students have a good opportunity to further their education with Master study programmes at foreign universities or in related study programmes at our University. Lithuanian road construction companies work in the local market as well as start penetrating the market of Poland, Russia, Belarus, and Kaliningrad", says former Head of the Department of Roads Prof. Alfredas Laurinavičius when talking about the speciality of Road Engineering. As the graduate of this Department Dr. Skirmantas Skrinskas puts it, from the old time to the present, serving the needs of the public has been the essence of the existence of national roads. Roads are the backbone of a national economy as well as its blood­vessels. A road is not only the link between civilization and culture but also history. It is also a reflection of faith as well as a symbol of our life journey. A country and its people can benefit from efficient freight flows on good, safe and ordered roads. Lithuania, as a transitional country, generates 2.7 times more GDP from transport business than the average of other European Union Member states. This is a significant achievement of people who build roads.